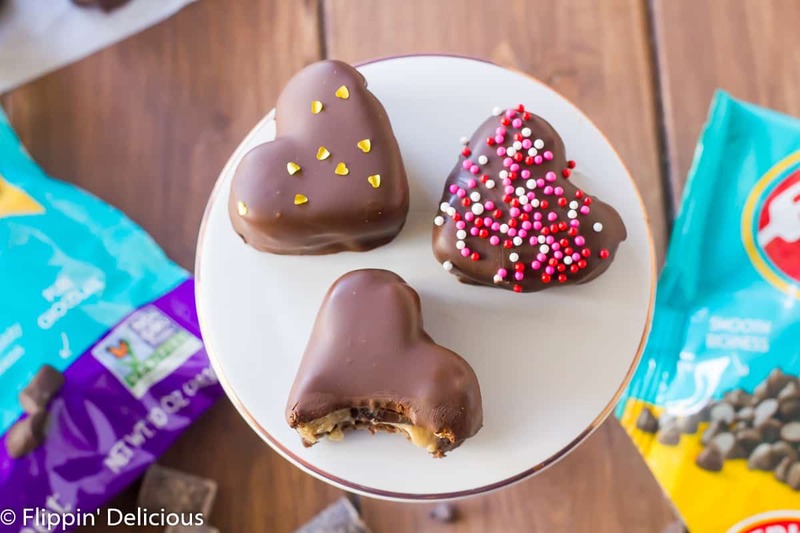 Gluten Free Cookie Dough Brownie Truffles are the perfect heart-shaped treat to give to your Valentine, or bring to your kid’s class party. This post is sponsored by Enjoy Life Foods. I LOVE many of their products, and for that reason I love working with them. As always, all opinions are entirely my own. Thank you for supporting the companies that Flippin’ Delicious™ works with. 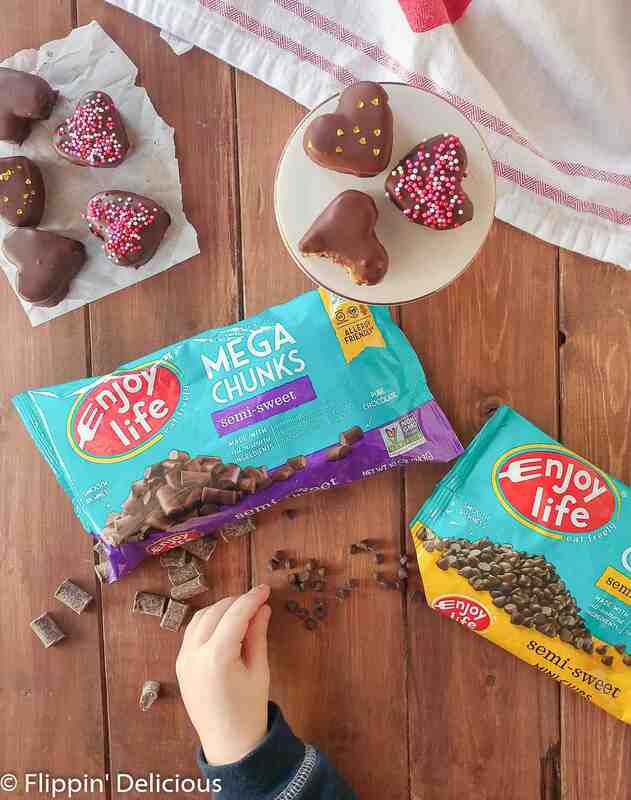 When Enjoy Life Foods asked me to create a Valentine’s Day recipe using their allergy-free mega chocolate chunks and mini chips, I knew just what I was going to make. It only gets better when enrobed in more chocolate…amiright?!?!?! 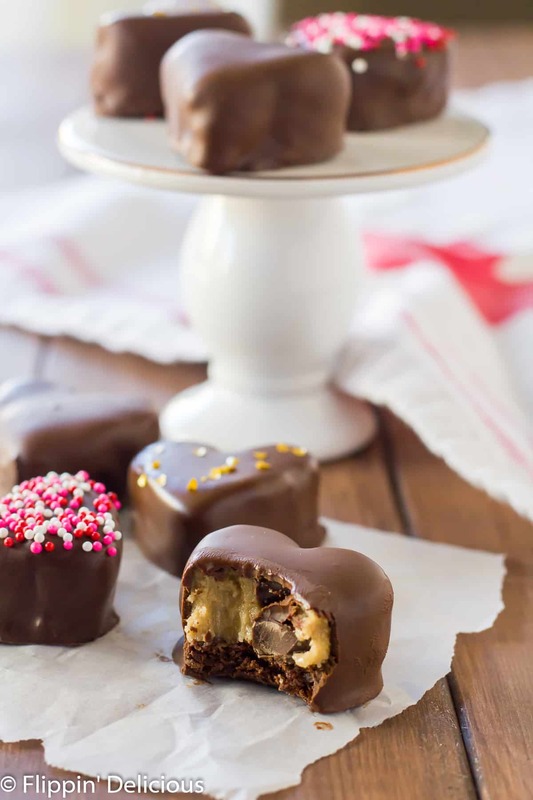 BONUS these Gluten Free Cookie Dough Brownie Truffles are dairy-free, and vegan too! Plus, all Enjoy Life Food’s baking chocolate AND chocolate bars are 15% off through Valentine’s Day! Use code CHOCOLOVE15 at checkout, and ORDER HERE! One thing I tried for the creamy edible cookie dough layer, that I hadn’t tried before, was baking the flour. I have seen other recipes do it, some claiming that it kills any bacteria in the flour, others that it cooks out the starchy taste. After trying it, I think I’ll always bake my flour for edible cookie dough! It takes just a few minutes, and it does keep the cookie dough from tasting too starchy or raw. I also made the cookie dough layer ultra creamy because I wanted it to complement the thin and chewy brownie that I made using Enjoy Life Chocolate Brownie Mix. The brownie provides the structure to the truffle so you can dip it even with the cookie dough creamy and soft. Then when you dip the bites in chocolate, it is the perfect combo of textures! The soft cookie dough is a little bit trickier to dip in the melted chocolate. So make sure you leave plenty of time for the truffles to chill after you cut them out with a cookie cutter, and before you dip them. I popped mine in the freezer for 15-30 minutes. When dipping the truffles that weren’t as chilled the cookie dough would separate from the brownie. If you want to avoid as much chilling time, just halve the milk in the recipe so the cookie dough isn’t as soft. 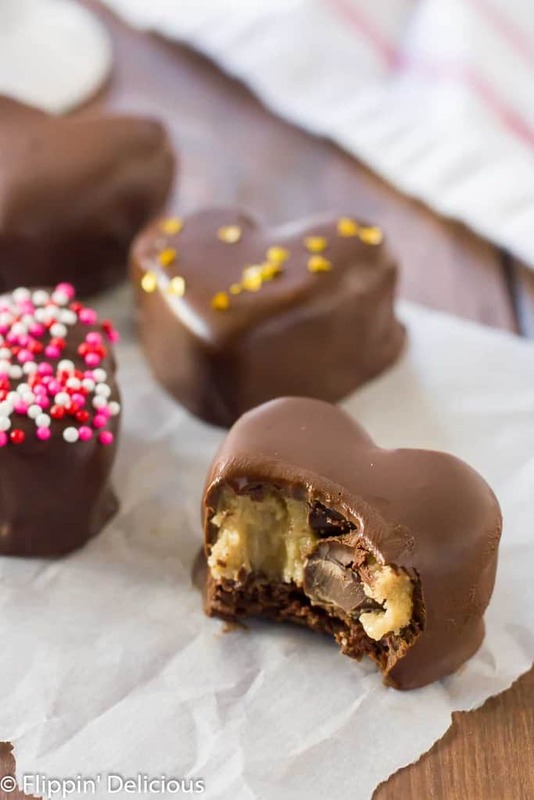 Gluten Free Cookie Dough Brownie Truffles are the perfect heart-shaped treat to give to your Valentine, or bring to your kid's class party. Preheat the oven to 350F. Line a sheet pan with parchment paper, or a silicone baking mat, and lightly grease. Prepare the brownie batter according to the directions and spread it evenly in the prepared pan. Bake for 11-13 minutes, or until a toothpick inserted near the center comes out mostly clean. Spread the flour in a pan and bake at 350F for 10-15 minutes, stirring every 5 minutes. In a stand mixer, or bowl with handheld electric beaters, whip the vegan butter with the brown sugar until fluffy. Add the powdered sugar and mix until smooth. Beat in the cooled flour, vanilla extract, and milk. Add the Mega Chunks and Mini Chips and fold them in with a rubber scraper/spatula. 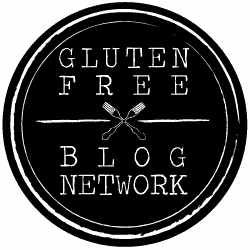 Spread the gluten-free cookie dough on about half of the gluten-free brownie (you can snack on the rest of the brownies, or pop them in the freezer to sprinkle on vegan ice cream or pudding) and chill thoroughly. I let mine chill in the fridge overnight, but 2-3 hours should be plenty, or an hour or two in the freezer. 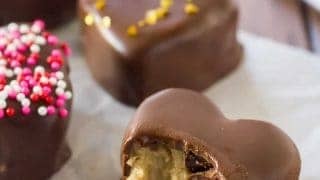 Using a sharp heart-shaped mini cookie cutter (about 1 1/2 inches across) cut out truffles, and place them back in the freezer to harden. Use paper towels to protect your hand, if your cutter doesn't have a soft grip. Place the chocolate and palm shortening in a microwave safe bowl. Heat in 30 second increments until ALMOST melted, and then stir until smooth. Cool to room temperature before dipping the truffles. 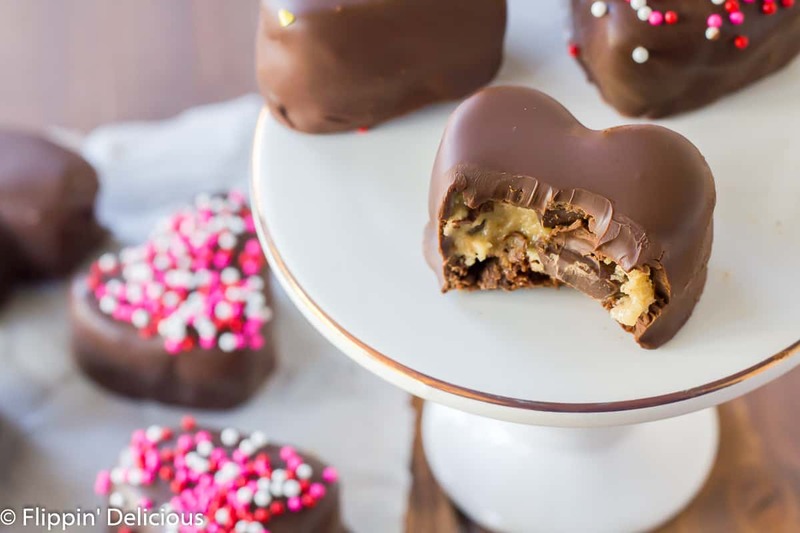 Remove a cookie dough brownie heart from the freezer. Place it on a fork and dip it in the melted chocolate. Shake off the excess, then place it on parchment paper or a silicone baking mat to set. I used a toothpick to slide them off the fork. If desired, decorate with sprinkles. What brand of Vegan Butter do you use? Thanks! These look amazing! Hi Shannon, I typically use Earth Balance or Smart Balance, but have also used MELT in the past, among others. 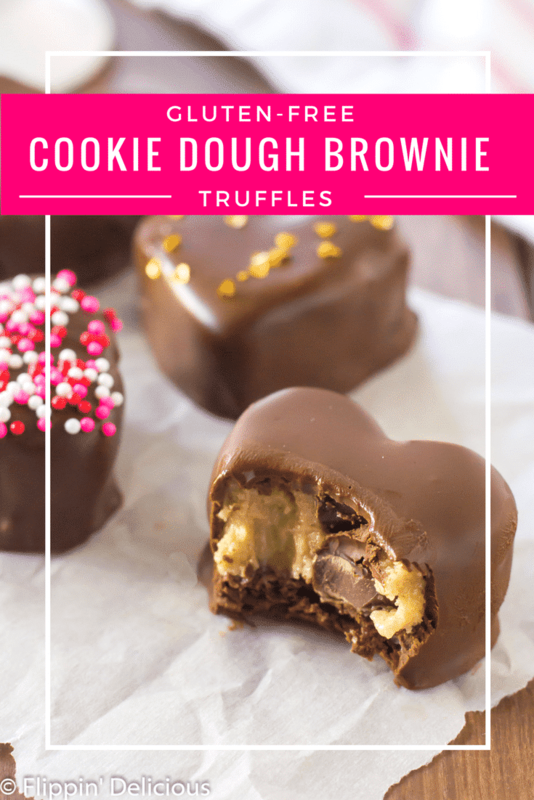 Those Gluten Free Cookie Dough Brownie Truffles look so perfect and delicious. Are you baking the the same way for both the crunchy and under-cooked results? If you are (same sized pan, same finish on pan, etc), then my best guess would be that maybe your oven has some hot spots, or cooks inconsistently. I do tweak Enjoy Life’s brownie mix when I make it. You can see how I like to tweak it in my Vegan Candy Cane Brownie Recipe, but if I remember correctly, I like to add a little extra oil and maybe some chocolate chips. 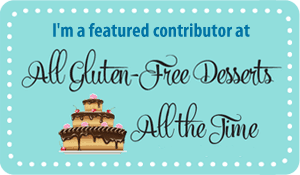 For this recipe, I didn’t tweak Enjoy Life’s box mix. I did, however, spread the batter out thinner, using a jelly roll pan. Hope this helps! Please comment back if you have any other questions, I’m happy to help!